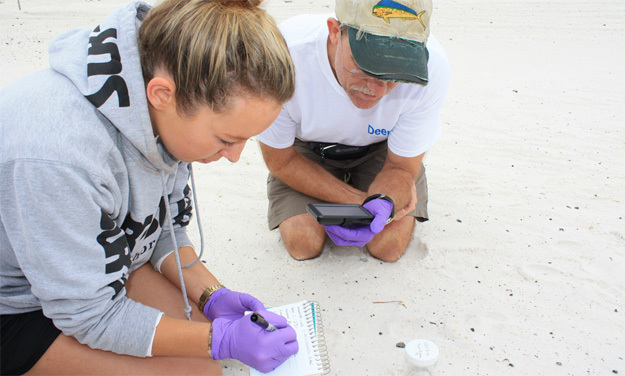 West Florida High School’s Marine Science students have been given an opportunity to engage in hands-on research that is as meaningful as it is fun thanks to a new initiative called Project Gulf Oil Observations (GOO). The research consortium Deep Sea to Coast Connectivity in the Eastern Gulf of Mexico (Deep-C) developed Project GOO which trains teachers and students to be effective citizen scientists and puts their new-found knowledge to use during visits to Gulf beaches in search of oil patties. 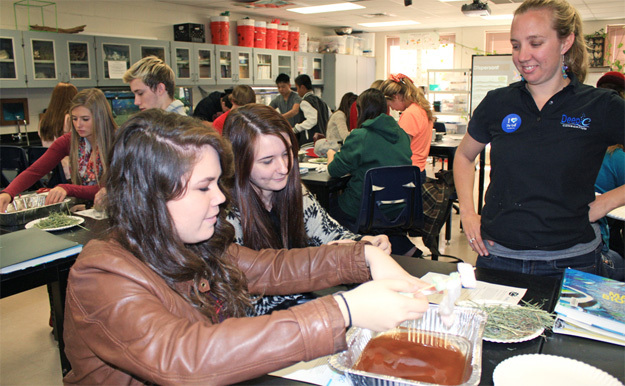 After months of collaboration and training in the classroom, WFHS students will get a chance to apply their skills in the field this Fridaywith a trip to Perdido Key. Amelia Vaughn and Danielle Groenen, members of the Deep-C consortium, along with Dr. Chris Reddy and assistant Catherine Carmichael from Woods Hole Oceanographic Institute, will participate with Shawn Walker’s WFHS Marine Science honors students. 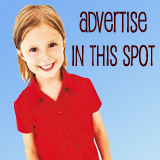 The goal is to apply scientific protocols in the retrieval of tar-patties that have washed up on the beach. “I’m very excited about the opportunity to engage my students in the process of science, the relevancy of Project GOO, and the collaboration with such highly regarded educators and scientists,” shared Shawn Walker, Marine Science Instructor at West Florida High School. “I cannot think of better vehicles to engage students than getting their hands dirty and learning how the world, in particular the ocean, works,” said Dr. Christopher Reddy, a Woods Hole Oceanographic Institution (WHOI) marine chemist and scientist with Deep-C.
Pictured top: Educator Amelia Vaughan oversees the students in Shawn Walker’s class as they test out one of their oil clean-up methods. 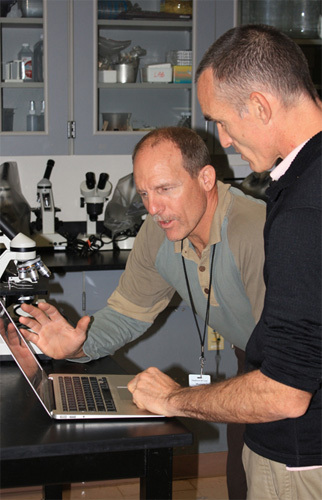 Pictured inset: High school teacher Shawn Walker and Chris Reddy of WHOI are deep in discussion about sample analysis. Pictured below: Catherine Carmichael, a research associate at WHOI, shows teacher Shawn Walker that taking detailed notes is essential when collecting data. Courtesy photos by Danielle Groenen for NorthEscambia.com, click to enlarge. Congrats!! I heard you talking a little about it in our last dept meeting! It looks and sounds awesome! I have known Shawn Walker for a number of years through the science department, and know him to be an EXCELLENT and commanding science instructor. It takes a quality educator to work with such a high-performing group of advanced students like those in a Marine Science honors class. Nice work, Shawn Walker! Thank you for inspiring your students through real-world and worthwhile science!